The current crisis in the eurozone has roots going back four decades to the negotiations that eventually led to the introduction of the Euro. In A Europe Made of Money, Emmanuel Mourlon-Druol examines those negotiations and the politics and motivations of those that participated. Aidan Regan finds that the book illustrates the important role played by political elites and EU institutions in shaping Europe’s economic and monetary union, and is a crucial read for those wanting to understand the eurozone’s current problems. A Europe Made of Money: The Emergence of the European Monetary System. Emmanuel Mourlon-Druol. Cornell University Press. 2012. 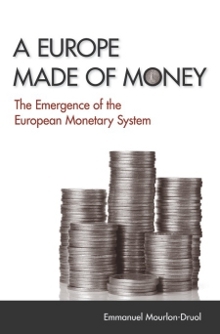 This book sets out to answer the question: why and how did a consensus emerge on the need to establish the European Monetary System (EMS) in the mid to late-1970s? The book’s major contribution is clear historic-empirical evidence that the negotiation of monetary policy is a deeply conflictual and political process. Emmanuel Mourlon-Druol, Research Associate at the University of Glasgow, argues against the dominant narrative that it was the EU Commission, and its president Roy Jenkins, that facilitated the move from the ‘snake’ system to the EMS. The book argues that the EU Commission reacted to a process that was already in the making and primarily driven by the stability oriented economic policies of a Franco-German alliance. The underlying technical foundations are traced through a series of reports emanating from various formal and informal policy committees. Hence, the author traces the consensus on the need for monetary co-operation, which subsequently became the vehicle for European integration, to a learning process among a transnational monetary elite and the emergence of the European Council. What exactly is meant, however, by this learning process, and the extent to which it was the EU Council or the interests of heads-of-government that mattered most, is not entirely clear, a problem I will return to. The book presents an impressive amount of evidence in tracing the precise diplomatic relations and technical reports that underpinned the creation of the EMS. The book begins with a focus on the new French administration under the political leadership of Valéry Giscard in 1974 and his relationship with the German Chancellor, Helmut Schmidt. Their personal experience and expertise in financial and monetary issues, in the context of an international economic crisis provided the conditions for a renewed focus on exchange rate stability. It describes the French initiative, aimed at a new monetary policy for Europe: the Fourcade Memorandum, which argued in favour of creating a new European Unit of Account (EUA), a policy backed by the EU Commission, and subsequently reflected in their study on EMU; the Marjolin Report. Both reports were ultimately shelved but exposed a crucial political debate that would divide policymakers throughout the period: will monetary integration induce economic convergence? Schmidt was firmly in the ‘economist’ camp and argued that economic convergence, particularly in relation to inflation and budgetary stability, must be a precondition for monetary integration. The Commission, particularly Roy Jenkins, fell into the monetarist camp. The book then goes on to describe the role of the EU Council in facilitating heads-of-government, particularly Schmidt and Giscard, to thrash out their diplomatic differences on monetary co-operation. German interests were crucial throughout this period, and monetary co-operation was primarily considered a tool of foreign policy. Most EEC states, with the exception of the UK, agreed to shift their domestic polices to promote low inflation. The author details the interplay between technical and political debates and their culmination in a Dutch initiative: the ‘Duisenberg’ proposals. The Dutch proposal introduced some new ideas into EEC monetary debates but the main effect was to get national governments to think beyond the rigid demarcation between snake and non-snake members. The author convincingly argues that it was the succession of new EU council meetings, from Copenhagen to Bremen in 1978 that mattered most in shaping the final consensus on the EMS. The Commission certainly played a new leadership position on monetary issues but the technical work had been thrashed out by a small number of individuals in specialised committees and informal working groups, particularly those nominated by heads of government. The political will necessary to forge a technical idea into an agreed monetary policy ultimately came from Britain’s self-exclusion and German acceptance. The author concludes that the EMS was really an extension of the Snake and a recycling of ill-fated proposals rather than a new economic breakthrough. The new exchange rate system reflected the core policy preference of the Bundesbank, particularly a consensus on stability-oriented economic policies and the fight against inflation. The French, Irish and Italian governments all signed up to a monetary regime that would provide an anchor for their new approach to domestic stability-oriented economic management. Germany compromised very little, and reflected in their refusal to countenance any form of federal-based resource transfers via the EEC budget. The final outcome ultimately reflected the distribution of power amongst EEC member-states, although the author does not state it as such because he interprets the politics of monetary co-operation as a process of social learning. There are two problems with this book. First, the author underestimates the importance of domestic material interests in the creation of EMS. Political elites certainly mattered but whether the politics of co-operation was a process of social learning is highly questionable. One could easily interpret the evidence that the outcome was driven by the bargaining power of Franco-German elites devising monetary policies in the material interests of their domestic economic and political constituents. It should come as no surprise that the consensus that eventually emerged was based on a Bundesbank inspired conservativism that effectively ignored the importance of redistribution and budgetary transfers. In this regard it is hard to see who was actually learning but it is clear to see which interests dominated the process. The EU council certainly had a role to play to framing the debate. But it begs a further question: was it the EU Council in-itself or influential heads of government that mattered most? That is, was the EU Council an instrument for domestic interests or transnational ones? The economic arguments put forward by the UK against EMS are somewhat dismissed by the author as political posturing but the implications of an asymmetrical monetary union have since proven to be correct. “One of my central themes is the complex interlinkage between domestic politics, economic policy, international developments, institutional issues, economic thought, and even apparently remote topics such as defence issues and memory”. Perhaps it is a methodological difference between social scientists and historians, but when an author attempts to include everything in their explanatory framework they run the risk of interpretive confusion. The implication is that the reader ends up interpreting the evidence in a potentially very different way than was intended by the author. Of course the interaction of transnational, national and supranational factors explain European monetary co-operation, but the more interesting question is which mattered the most. I would argue based on the evidence presented that it was national interests. Despite these theoretical and methodological shortfalls, the book is an excellent contribution to European economic history. It illustrates the critical role of political elites and European institutions, particularly the EU Council, in shaping the multi-level governance framework of EMU. It is crucial reading for those wanting to understand the problems afflicting the Eurozone today. Aidan Regan has a Max Weber Postdoctoral fellowship at the Department of Political and Social Science in the European University Institute (EUI), Florence, Italy. His research interests include the comparative political economy of labor relations, varieties of capitalism, welfare states, income inequality and processes of institutional change in the European Union. Read more reviews by Aidan.